Some out-of-the-box thinking among Anglo American's (LON:AAL) board members could see outgoing CEO Cynthia Carroll be replaced by a leader from a very different industry – cellphones. “Appointing Nhleko as CEO will come out of the blue for international investors. The reason Anglo is in the mess isn't because they haven’t had a strong mining person at the helm since Tony Trahar (Ms Carroll’s predecessor) took over in 2000,” the analyst said. "An analyst who has covered MTN extensively for many years said Mr Nhleko would be a brilliant appointment for Anglo. Nhleko is the only South African on Anglo’s board and the country's public pension fund – one of Anglo's largest shareholders – has been pushing for greater representation of South Africans among Anglo's leadership. The African nation still accounts for some 50% of the London-listed group's operating revenues. From a standing start in 1994 MTN has grown into a worldwide emerging market powerhouse with operations in 21 countries in Africa and the Middle East including Afghanistan with a subscriber base of more than 175 million people. What could also stand Nhleko in good stead is the fact that he cut his teeth in investment banking in 1990s. After joining MTN he lead a number of blockbuster deals and also oversaw MTN's entry into Nigeria, considered very much a frontier market at the time, but now represents the bulk of the Johannesburg-based company's profits. Nhleko – whose investment firm is part of a consortium that owns 8% of BHP Billiton's coal operations in South Africa – on Sunday denied he's in talks with the board. 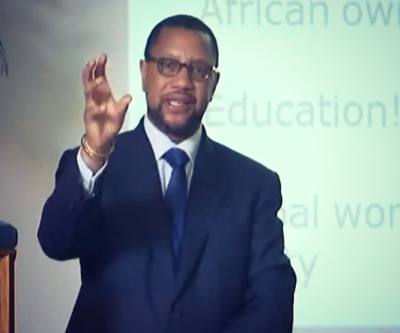 Image of Nhleko speaking at Africa Day Conference in 2011 from Youtube.